E-cigarettes have grown popular today considering the skyrocketing number of people who use them. Although they are often used by regular cigarette smokers as a tool for quitting smoking, they are not that effective as always presumed, according to a new study by the University of California, San Francisco. The study focused on 949 regular smokers, 88 of which reported they had used e-cigs within the last month. Majority of the smokers intimated that they wanted to quit smoking one day, either after six months or thereafter. Smokers who used electronic cigarettes said they planned to quit smoking while a paltry 5% e-cig users said they had no plans of ever quitting, compared to 13% of participants who didn't use electronic cigarettes. After one year, the participants were asked whether they had successfully managed to quit smoking. The quit rate results between the smokers and the e-cig users did not have a significant difference. Only 10.2% of the e-cig users said they had successfully quit smoking as compared to 13.8% of the regular smokers. Dr. Pamela Ling, the study co-author says, "There are several stories of people claiming that e-cigs help them quit smoking, but our systematic study did not find a notable effect of electronic cigarettes on cessation." Such stories are just based on perceptions and theories. 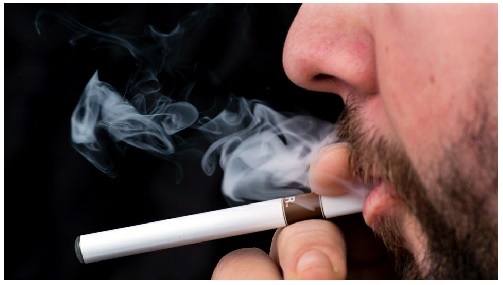 According to the study, there is a group of people who were more likely to use e-cigarettes. They include women, younger adults under 30 years of age and less educated people. Ling adds, "Every credible information should be backed up by correct data and so the claims that e-cigarettes can help one quit smoking are not true as they don't have any data." Most e-cigarette makers usually claim or suggest that e-cigs can help in smoking cessation to entice and attract potential consumers. The study acknowledges this dishonest approach and suggests that the government should come up with regulations to ban e-cigarette manufacturers that advance such claims. In the recent years, the popularity of electronic cigarettes has increasingly grown with various surveys recording a considerable increase in the number of individuals using the devices. One of the major reasons why many people like "vaping" on e-cigs is because it enables them to mimic smoking in areas where smoking is banned. Others love the exceptional vaping experience as they inhale the flavoured "juice" inside the e-cig and exhale the vapour. Apart from researchers, public health officials have also raised concerns about the e-cigs. Many public health officials have noted that there are few studies that authenticate the ability of the devices to help smokers quit nor their safety when used. The sale of e-cigs with nicotine-rich flavour cartridges is not allowed in Canada unless specifically authorized by the Health Canada. Although this federal agency has not authorized any manufacturer to produce e-cigarettes with nicotine-laced juice, this does mean that there are no unscrupulous e-cig retailers in Canada selling such products. Just as the Health Canada has the mandate of ensuring that illegal e-cigs are not sold in the market, the citizens also have a duty of ensuring that they don't buy such products. "We believe that electronic cigarettes are less harmful compared to cigarettes and can help smokers quit since they have no combustion or tobacco. However, there is no scientific evidence suggesting that they are completely safe to use," she added. Due to this, Tilson suggests that more studies should be conducted on the effectiveness and safety of electronic cigarettes as good smoking cessation aids. Non-Smokers' Rights Association stresses that it would be logical to base their policies on much more credible studies that clearly show that electronic cigarettes can either help smokers quit or are basically nicotine patches that would be harmful to the body. So basically, rigorous study is what will unmask the hidden side of these devices.